Houses can be sold for a huge variety of reasons, whether you are simply relocating to a new family home or you have inherited an empty property following the death of a loved one. Once you have made the decision to sell there are few things more irritating than the frustration of not being able to shift your property – either from a general lack of interest or a lack of viable offers. The five tips below give you a good place to start if you are in the process of selling a property and would like to speed up the process or get the most out of your money. Nothing is more off-putting to a potential purchaser than a dirty house that they couldn’t imagine themselves living in comfortably. Especially true if the property has been inherited and has not had much attention in recent years, a good deep clean will go a long way towards improving the overall appeal. Pay particular attention to rooms such as the kitchen and bathroom, as well as any areas that are in potential purchaser’s eye line as they enter the room. Whilst cleaning the property it is also a good idea to try and remove as much excess clutter as possible to maximise the available space. Although the last thing you want to do when trying to sell a property is spend a fortune on it, a few small improvements will definitely be worth the investment. Whilst large-scale renovations such as a new kitchen would be an unnecessary expense, things such as a new coat of paint and replacing any damaged woodwork are relatively inexpensive and can really lift a room. If you do carry out some renovations to your property prior to sale, it is wise to set yourself a strict budget and stick to it. It is far too easy to get carried away and end up spending far more than you intended without gaining any extra benefit. In some situations it may be worth considering selling your property in ways other than the traditional estate agent route. Many people are now choosing to sell using online estate agents, cutting out the high commission fees and opening up their property to a far wider potential market. If the speed of your sale is particularly important then you may want to employ the services of a cash property buyer. These companies may pay slightly less than you would achieve on the open market but can guarantee a quick and easy sale. This can be particularly appealing in situations where you need to complete a sale in order to purchase your new house. Often properties that are awaiting sale can be left unoccupied, for a variety of reasons. In this situation, there are a number of specific steps that should be taken to ensure that your property remains secure. Try to keep the lawn mown and avoid piles of post building up in doorways – these are tell-tale signs that nobody is living there and can attract opportunist thieves. You should also make sure that you have suitable empty property home insurance in place. This will mean that should your property be targeted you will have the funds to repair the damage. Although everyone obviously wants to achieve the best price when selling their home, it is important to be realistic. If the housing market is particularly slow and you want to sell fast then knocking a few thousand pounds off your asking price may be necessary. If in doubt, it is worth doing some research into comparative properties in your area – how long did they take to sell and, more importantly, what was the final sale price that was achieved? By implementing these tips you stand the best chance of selling your property in the shortest time possible and for the best price. Some of them will give you a quicker sale while others will result in a higher sale price. All you need to do is decide which is your highest priority when it comes to selling your property. "Straight talking, straight dealing", "Very good, very professional"
Take the first step by completing the form or calling one of our advisors free on 0800 0845 025 (anytime). Never again have to ask "Who will buy my house now?" P.S. 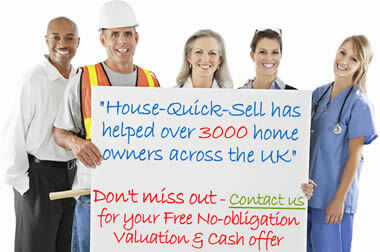 Our "sell my house online" service is FREE so IF you don't like our offer you can simply walk away!